Part of Andrew Carnegie's vision for the performance hall in New York City which bears his name was that it include a complex of apartments and studios where artists and photographers, musicians and dancers, writers and teachers could live and work. It would be an artistic environment conducive to the creation and teaching of art, where creative people could share ideas and influence each other. And for 116 years, the Carnegie Hall Towers did just that, providing both home and workspace for a veritable whos-who of American culture including such famous names as Lee Strassberg, Marlon Brando, Isadora Duncan, Norman Mailer, and many more. LOST BOHEMIA chronicles the last days of this once vibrant building, or perhaps more accurately the last days of Carnegie's vision for the building. The structure is still there, but the artists have been evicted and the once unique spaces have been gutted and replaced by generic offices. 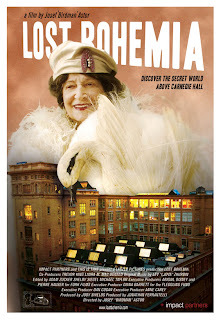 But as this documentary begins, among those still living there are New York Times photographer Bill Cunningham, screenwriter and director Andrew Bergman (THE FRESHMAN), singer Jeanne Beauvais, acting teacher Robert Modica, a mysterious unseen poet, ninety-plus year old portrait photographer Editta Sherman, and the director of this film, John Birdman Astor. Some of these people have been living in the building for close to 50 years. Despite that, and despite the fact that real work that benefits the culture of the entire city is being done in this environment, the Carnegie Corporation wanted the tenants out (boo hiss). They fight a quixotic battle, but I don't think it's a spoiler to say that once again the little guy loses. It's a story we've seen many times before (see the documentary THE ART OF THE STEAL for another recent egregious example), and will likely see again as people with no sense of culture or history bulldoze a past they have no use for in the pursuit of a few more dollars. Astor does not look at his subject with a detatched, dispassionate eye. His film is unabashedly biased and angry. What else would you expect from someone being evicted from their home not because they were a bad tenant, but because the property owners wanted simply decided they had better uses for the space, so tough luck? 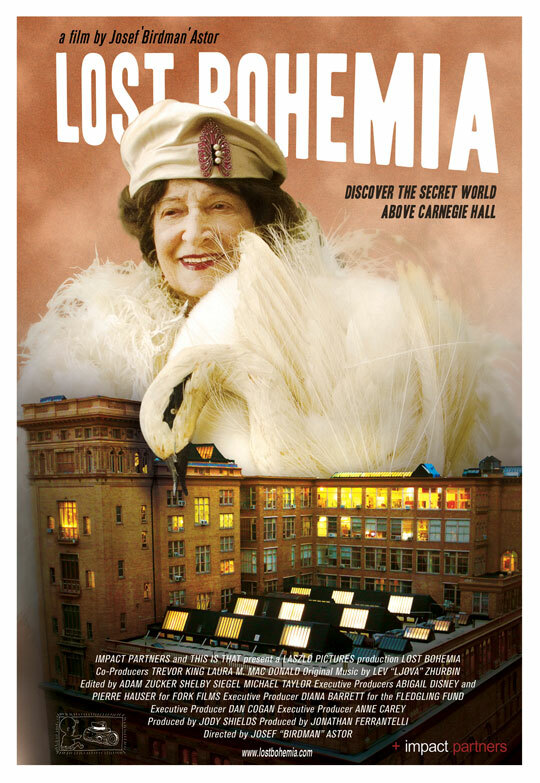 But more than anger, Astor conveys his love for the characters who populate the building, even the most eccentric of them like the octogenarian who practices ballet in the stairwells. Even as he's filming LOST BOHEMIA , it's obvious Astor realizes he can't hope to change anything with this movie. All he can do is document the passing of a community that would be next to impossible to replicate in this day age, and give the viewer of sense of what has been lost. There's a strange kind of irony here as we see how the wishes of one of the purest, most ruthless capitalists in American history can be brushed aside in that same spirit of capitalism. That's little consolation for the people who lost far more than just a space in which to live and work, though. 4 out of 4 stars. I really enjoyed this review. It is interesting that Carnegie started to genuinely question his ruthless capitalism, writing: "The amassing of wealth is one of the worst species of idolatry. No idol more debasing than the worship of money. Whatever I engage in I must push inordinately therefore should I be careful to choose that life which will be the most elevating in its character. To continue much longer overwhelmed by business cares and with most of my thoughts wholly upon the way to make more money in the shortest time, must degrade me beyond hope of permanent recovery." I'd like to see that engraved on the facades of the CME and NYSE. One never learns the nature of the businesses that will fill those sterile cubicle-offices that replace the evicted arts folk here. One would not be surprised if it's telemarketing, brokerages, outsource-consulting, i.e. nothing that produces anything or does anyone any good. But if I may interject this curmudgeony note in defense of Carnegie Hall (future name: Carnegie Wal-Mart) I have lost much faith that most modern "artists" produce anything of real value anyhow. This documentary is an exception.